I am intrigued by minimal quilts. It’s funny, though, that a minimal quilt takes large sections of the same fabric. That usually means buying the same fabric in large qualities you might not purchase otherwise. So not so minimal. 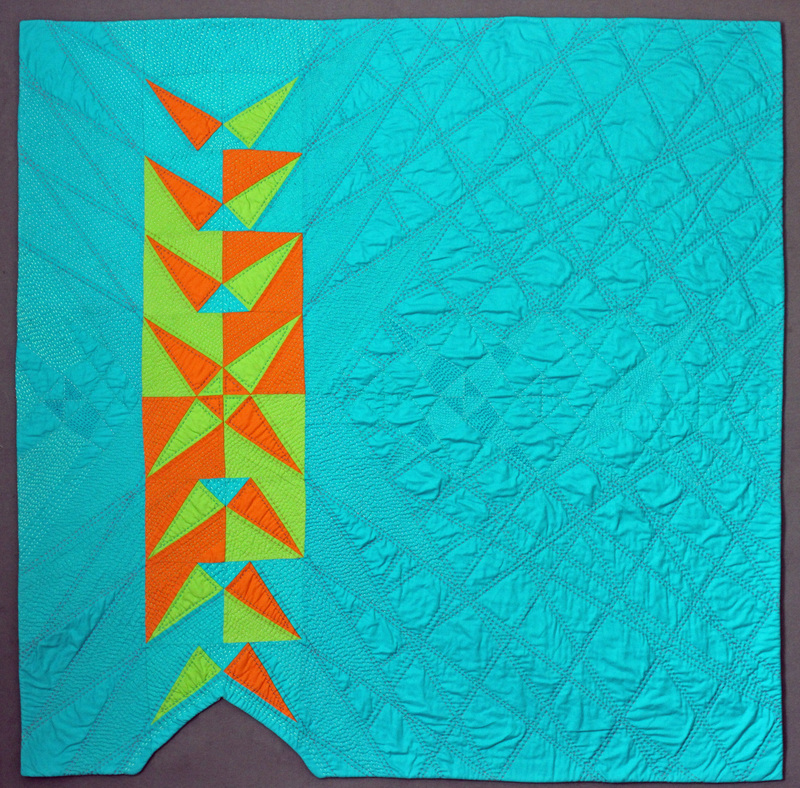 Gwen Marston’s book, Minimal Quiltmaking, was one of the first modern quilt books I purchased. I’ve not been at this modern quilting for that long. I got the book through American Quilter’s Society, which I joined last year. Marston explains that her quilt, Red Square in Purple, had its roots in the early 1800s and was based upon a New England quilt. Discovering quilts like the c.1800 one is exactly why I’m always harping on the value of knowing what came before. The grandness of the old quilts, and others like it, is one of the reasons I value the tradition of quilting so much. The traditional Crossed Canoe block is in the middle. 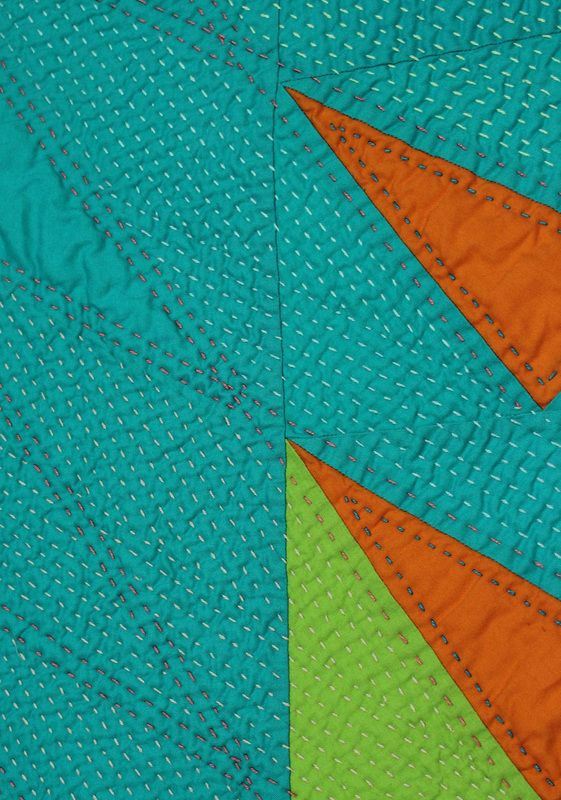 The block itself has four parts so I made four blocks with the canoe surrounding by the background fabric, followed by blocks with one of the canoe colors added. It’s an exploration of this traditional block. I hope you can see I hand quilting some “ghost” canoes. I left some of the sections unquilted and love how they look like water. I did not use a traditional folded binding. Instead I used facing binding. I wrote about how to do this technique in a previous post. The cut-out at the bottom was difficult, I will admit, but worth it because it looks like another canoe or maybe a shark attack — haven’t decided. I learned that making a minimal quilt is a thoughtful process and it takes more than just large amounts of the same fabric. I like what you did with Crossed Canoes–the gradual deconstruction of the block.It reminds me of the Fracture approach to prints in a way. Nice quilting to compliment it too. I too love minimalism and find it quite a challenge to be both minimal and interesting. You did it! Love that word: deconstruction. That explains what I did. Love: I never get tired of hearing that. Wanda — the pieced image is wonderful, but even better is the hand quilting and the texture and subtle shading that it provides. Absolutely amazing. I agree the quilting makes the quilt. Wanda – this is so visually interesting I just love it! Great finish Wanda! This could go in either category, minimalism or modern traditionalism, since you have deconstructed the Crossed Canoes block. I must give hand quilting a try. Hand quilting is relaxing and the final quilt is really soft after all that handling. This is really beautiful Wanda. It’s both complicated and minimal at the same time. Very impressive. Thanks, Lisa. Minimally complicated — I like it. I must have missed this post Wanda, this is a gorgeous quilt. Well done.